EDWARD SCHUTZMAN, 72, passed away Aug. 1, 2016, after a long illness. He was an attorney and certified public accountant. Mr. Schutzman was born in Detroit on Jan. 21, 1944, and was a graduate of Wayne State University and the University of Michigan Law School. He will be remembered as a man of great intelligence, integrity and honesty who had a terrific sense of humor. He is survived by his wife of 49 years, Judith; his sister Karen Eisner; brother-in-law, Fred Ostrow; sister-in-law, Marge Marx; 8 nieces and nephews; 10 great-nieces and great-nephews. 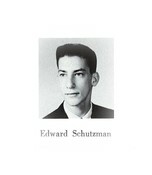 Mr. Schutzman was predeceased by his parents Benjamin Schutzman and Hilda Greenberg; and his step-father, Abe Greenberg. Services were held. Contributions may be made to the Jewish Community Federation, 121 Steuart St., San Francisco CA 94105. I knew Eddie as a classmate at Hampton School, before we entered the relative anonymity of high school. A smart, sweet,guy. Gone too soon.